On the front door of Ritz PDB a sign read, "Complet/Sold Out." In fact, the show had sold out a few days prior. Un Blonde and Crosss have carved their place for years, whether it is in Calgary, Halifax, Montréal or Toronto. 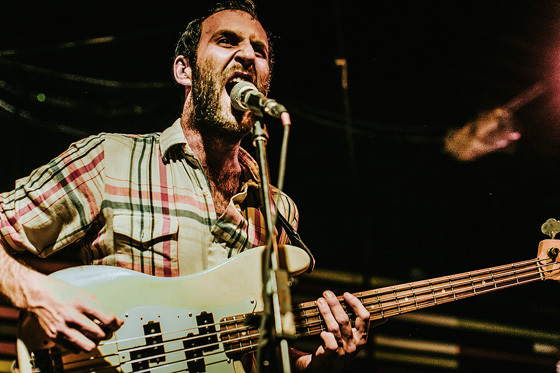 Viet Cong is already legend, and this show would prove it. Many mention the band Women when they discuss Viet Cong, but while that's important to remember, Viet Cong have made their own name at DIY shows, dive bars and everywhere else in between. A year or two ago, one could catch them at a house in a small town in Ontario. Things have definitely changed. Un Blonde opened the show with a very radical sound, somewhere between Frank Ocean and the Rapture. Some parts are delicate R&B and others are blasting squalls of treble-soaked guitar, with Jah Wobble bass, sampler, synth and percussion. Singer/guitarist Jean-Sebastien Audet danced with the microphone stand while crouching and thrashing the guitar, and their drummer, who was standing up, played a piece of sheet metal on a stand. It was refreshing to see a band play such a strange mix of sound, and the audience really enjoyed it. Crosss have recently gone through a lineup change with the departure of Haligonians Ryan David Allen and Nathan Doucet, but they're markedly close-knit now. It is sad without the solid foundation of Ryan's bass playing and the off-the-chain bombastic charisma of Nathan's drum fills, but the new members were awe-inspiring in their own way. All the songs flowed like a glorious golden river of sludge, while the only dialogue was singer Andy March asking for more sound in the monitors (a common occurrence the whole night) and quietly thanking the other acts. Crosss are a stoic band but the music speaks volumes — a LOT of volume, to be precise. It's been a long time coming for Crosss, and their new bassist and drummer both shredded the songs perfectly. The band called Viet Cong that played Izakaya Sushi House years ago is no more; what remains is a supernatural force. These musicians are so unbelievably in tune with each other. They mainly played songs off of their self-titled Flemish Eye/Jagjaguwar LP, but threw in some old songs as well as a brand new one in their completely improvised setlist. Guitarists Scott Munro and Daniel Christiansen were so locked that it sounded like one central being with multiple arms playing two guitars entirely in sync. Bassist Matt Flegel held the band together and sang in a way that made hearts smile. Drummer Mike Wallace was a star completely on his own, keeping every song at metronome precision. Viet Cong's intricate and spastic sound brought a mosh pit — in which BRAIDS' Raphaelle Standell-Preston held down the mosh on the North-eastern part of the pit — yet the beat and feel of the songs brought the dance in everyone; even the photographers stopped for a few precious seconds. Viet Cong are honestly doing amazing things right now, but who knows what the future holds for them. They are already achieving great things, and this stacked, sold-out Montréal show was testament to that.